National soccer stadium and music arena evacuated after 'ambulance' found packed with explosives, bombs outside concert. Potentially lethal bombings at two sites in Hanover, Germany were defused on Tuesday night, just days after Muslim terrorists carried out lethal coordinated attacks in Paris. The similar nature of targets selected in the attempted bombings Tuesday make it likely to have been an attempt by Islamists to repeat the carnage in Paris on Friday, in which 129 people were murdered. Shortly after the German national soccer stadium in Hanover was evacuated on Tuesday night, reports revealed the cause: an ambulance loaded with explosives was discovered parked outside. The discovery at the HDI Arena came just before an international friendly between Germany and the Netherlands which was canceled, reports the British Mirror. The German national team was whisked off to a secure area of the stadium. The police chief of Germany's Lower Saxony region Volker Kluwe told NDR that authorities "had concrete intelligence that someone wanted to set off an explosive device inside the stadium." The game was canceled about one-and-a-half hours before it started. It appears that the ambulance found packed with explosives was actually an ordinary truck disguised as an emergency medical vehicle to enable a potentially lethal explosion targeting unaware civilians. Another site in Hanover was also evacuated by police on Tuesday. 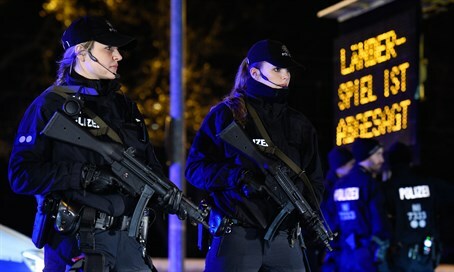 The 14,000 seat TUI Arena, a music arena, was to hold a concert by the band The Söhne Mannheims.Police received a "concrete threat" about a bomb, according to the German DPA. Tuesday's scare comes following the Islamic State (ISIS) attacks in Paris on Saturday, in which no less than 129 people were murdered. One of the six coordinated attacks took place just outside the French national stadium, during a friendly match between France and Germany. Three suicide bombers detonated, murdering one victim; the terrorists apparently intended to enter the stadium. Likewise the Bataclan theater was attacked during a concert, in the most lethal of the attacks that left 82 dead.